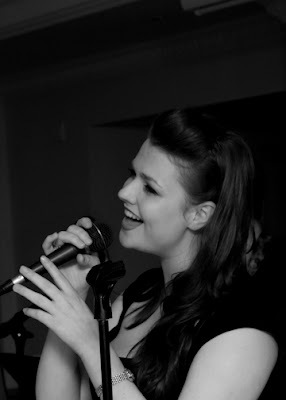 On Friday 15th April 2011, Down for the Count provided the music for the wedding of Rosalind and Oliver Lambert in Marlow-on-Thames. Here is their account of their special day. We hunted high and low for a band with a broad repertoire, high quality vocals and instrumentals. None quite matched up to Down for the Count. We found it very scary hiring a live band - if it went well, it would be amazing and so much better than a DJ, but if they were late, too loud, not up to scratch the whole day could be ruined. From our first enquiry through many follow-up requests Mike was helpful and efficient every step of the way. He also managed to liase with me, the bride, and my Mum, keeping secrets where appropriate! Our wedding wasn't until 4pm, so our guests had plenty of time to get there and get ready. We also had plenty of time to get ready, which was great for the bride and bridesmaid, but allowed the groom to get a little nervous about his speech and our first dance. Our guests assembled from around 3.30pm with Mike playing a selection of romantic songs from our favourite musicals on the keyboard. Before we knew it 4pm had arrived and the bride entered to "The Arrival of the Queen of Sheba" which everyone felt was very appropriate! The ceremony flew by, we hardly heard our vows, as we were concentrating so hard on what we were saying. Mike played "Jesu Joy of Man's Desiring" and "Ave Maria" while we signed the register, which was wonderfully calming. Once the ceremony was complete we made our way outside to Handel's "La Réjouissance". I'd like to say we remember that bit but we were a bit overwhelmed by that point. 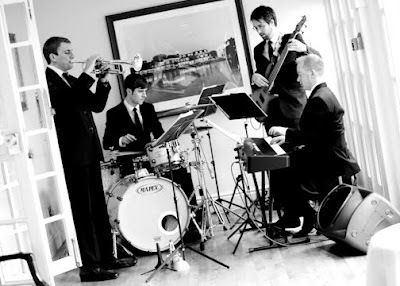 However after a quick sprint Mike joined his bandmates in the next room, to play a favourite of the mother of the bride, Louis Armstrong's jazz version of "Here Comes the Bride" from the film "High Society". This was secret Mike had kept from the bride, and a very lovely surprise it was too. The jazz band continued to play as we drank champagne and had photographs taken in the sunshine. After dinner the rest of the group had assembled to form the full 9-piece function band and we were ready for our first dance, "The Way You Make Me Feel', specially arranged and learnt at our request. This was the most nerve-racking part of the day, as we had practised with the recorded version but obvioulsy hadn't heard the band. Their performance was spot on and kept to just three minutes, as requested. The original is over five minutes and therefore far too long to keep dancing for! The dancing continued all evening, with a bit of something for everyone, including a few current songs on our iPod while the band took their breaks. The dancefloor was heaving all night and everyone enjoyed the music immensely. They wrapped our evening up for us with a final dance of "Rock With You", after which we left everyone else to dance a little longer, and we headed down the road in a personalised london taxi! A huge thanks to everyone in Down for the Count, especially Mike. 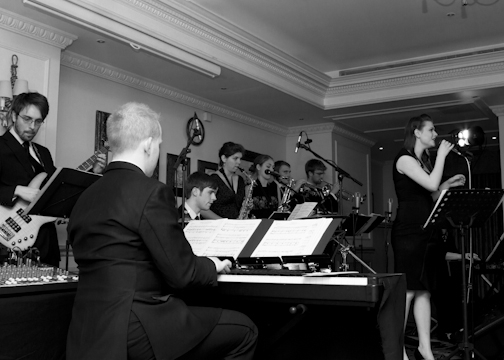 We hope you choose to invite them to perform at your wedding - whichever part of the day you want them for, we know they can cover whatever you might want, just as they did for us!